Northern Ireland, a long-contested region of the United Kingdom, experienced decades of conflict between the late 1960s and the late 1990s that claimed more than thirty-five hundred lives. The era, known as the Troubles, largely pitted the historically dominant Protestants against the Catholic minority. A peace deal struck in April 1998 created a power-sharing government that included political forces aligned with armed groups. Twenty years later, most of the Belfast Agreement—usually called the Good Friday Agreement—has been implemented. Although paramilitary groups still exist, they have mostly disarmed, and to a large extent violence has ceased. However, with Belfast’s main political institutions suspended and Brexit throwing long-standing assumptions into doubt, Northern Ireland’s future is far from assured. What has driven the conflict in Northern Ireland? Northern Ireland’s modern period of conflict started in the late 1960s and lasted more than three decades. 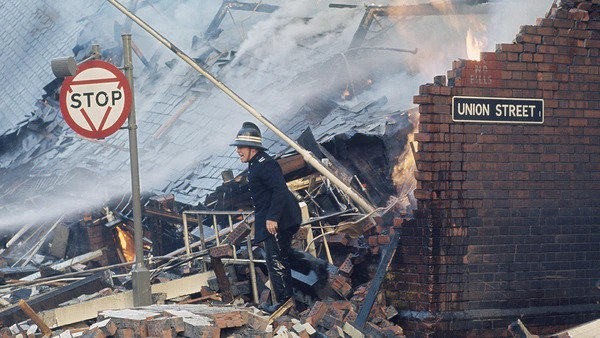 What started as a civil rights movement—Catholics protesting what they saw as discrimination by Northern Ireland’s Protestant-dominated government—deteriorated into violence, with the involvement of paramilitary groups on both sides and the arrival in 1969 of the British Army. The conflict involved mostly Protestant loyalists, who wanted to remain part of the United Kingdom, against mostly Catholic republicans, who wished to unite with the Republic of Ireland. Protestant unionists and Catholic nationalists shared their respective communities’ goals but tended to eschew violence. Reached in 1998, the Good Friday Agreement provided a framework for political settlement in Northern Ireland centered on power-sharing between unionists and nationalists. It was signed by the British and Irish governments, as well as four of the major political parties in Northern Ireland: Sinn Fein, the Ulster Unionist Party, the Social Democratic and Labour Party, and the Alliance Party. Among major parties, only the Democratic Unionist Party (DUP) abstained. While the agreement confirmed that Northern Ireland is a part of the United Kingdom, it stipulates that Ireland could be united if that was supported in a vote by majorities in both Northern Ireland and the Republic of Ireland. The agreement called for the devolution of authority over certain policy areas from the UK Parliament to a newly created assembly in Belfast, and it paved the way for paramilitary groups to abandon their weapons and join the political process. It has contributed to a sharp reduction in violence, and the annual conflict-related death toll, which peaked at 480 in 1972, has dropped to the single digits in recent years. 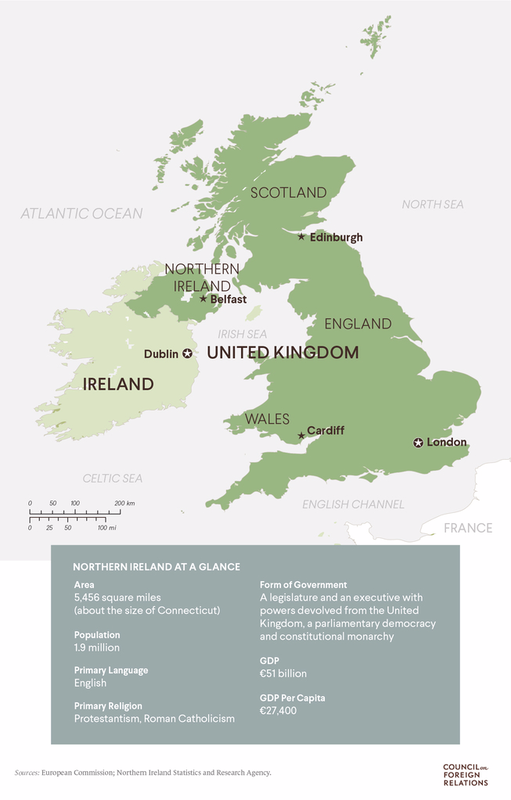 What is the governing structure of Northern Ireland? The government in Northern Ireland is composed of two main bodies, both based at the Stormont Estate in Belfast. A popularly elected, ninety-member assembly legislates on matters such as trade, health, education, and agriculture. The assembly requires support from both unionists and nationalists to make important decisions, ensuring that neither can dominate. A cabinet-like executive administers the government. It is chaired by a first minister and a deputy first minister, one from each main tradition. So far, the first minister has always been a unionist and the deputy first minister a nationalist or republican. Has the Good Friday Agreement been successful? Distrust among the factions persisted for years after the accord. Political jockeying over devolution—the transfer of police, judicial, and other powers from London to Belfast—and the decommissioning of paramilitary groups’ weapons hindered implementation of the Good Friday Agreement. While London devolved local powers in late 1999, political turmoil in Northern Ireland prompted it to reimpose direct rule in 2000 and again in 2002. London only restored the devolved government in 2007, with the breakthrough St. Andrews Agreement, signed by the UK and Irish governments and Northern Ireland’s main parties. By then, the DUP was the largest unionist party and Sinn Fein the largest among nationalists and republicans. Another milestone came in 2010, with the Hillsborough Agreement, in which Sinn Fein and the DUP finally agreed on terms for the devolution of policing and justice functions, as well as a roadmap for managing sectarian parades. By the mid-2010s, the political institutions envisioned in the Good Friday Agreement were generally functioning well, as parties with starkly differing views served together in government. What is the status of Northern Ireland’s government? The relative political stability in Belfast began to unravel in 2017, when an energy scandal precipitated the resignation of Sinn Fein’s Martin McGuinness as deputy first minister. This caused the executive’s collapse and led to fresh elections for the assembly in March 2017. However, more than two years after the vote, the two largest parties remain unable to resolve their differences, and Northern Ireland remains without a government. Faced with this impasse, London could call new elections or resume direct rule. It has so far avoided either option, preferring to encourage continued negotiations, though in 2017 and 2018 it set Northern Ireland’s budget, tax rates, and related provisions. What were the results of the 2017 elections? Though the 2017 vote did not lead to a restored assembly, Sinn Fein was largely seen as the winner. While the DUP remained the single largest party, the two largest nationalist parties, including Sinn Fein, won thirty-nine seats versus the two largest unionist parties, which won thirty-eight. This ended the unionist parties’ long-standing plurality in the assembly, a result indicative of Northern Ireland’s demographic shifts. As of the last census, the minority Catholic population has increased to 45 percent of Northern Ireland’s 1.8 million people, while Protestants, no longer a majority, now make up just 48 percent. Though the 2017 vote did not lead to a restored assembly, Sinn Fein was largely seen as the winner. Despite this electoral setback, the DUP gained influence in London in June 2017, when UK Prime Minister Theresa May lost her Conservative Party’s majority in parliament and allied with the DUP to remain in power. May promised some $1.4 billion in new funding for Northern Ireland, but Sinn Fein leaders criticized the deal as imperiling the UK government’s impartiality and its commitment to the Good Friday Agreement. Recent disagreements have centered on language and culture. Sinn Fein seeks legislation to promote the Irish language, while the DUP insists on a similar measure for Ulster Scots, which is traditionally spoken by the descendants of Protestants who came to Northern Ireland from Scotland. Sinn Fein, meanwhile, has undergone a generational shift in leadership, with the 2017 death of McGuinness and the retirement of long-time republican leader Gerry Adams as party president. Other issues also continue to cause friction. Parades and marches—held mainly but not exclusively by Protestant groups—can have heavily sectarian undertones. The same is true of flags and emblems, displayed by all sides on lampposts and buildings. Moreover, Northern Ireland’s leaders have never developed a comprehensive approach to the legacy of past violence, as some other postconflict societies have. Efforts to prosecute those responsible for killings and to pursue other initiatives have been uneven, something analysts say has hindered reconciliation. These issues—parades, flags, and the legacy of the past—were the subject of 2013 negotiations chaired by Richard N. Haass, president of the Council on Foreign Relations, and Meghan L. O’Sullivan, an adjunct senior fellow at CFR. The talks, which involved the five main political parties, did not produce an agreement, though many of the proposals—including establishing a historical investigations unit to look into unsolved deaths during the conflict and a commission to help victims get information about relatives’ deaths—formed a large part of the Stormont House Agreement, reached in 2014. Implementation of that agreement has lagged, however. How will Brexit affect Northern Ireland’s economy? A majority of Northern Ireland’s people—almost 56 percent—voted for the UK to remain in the EU. The DUP was alone among Northern Ireland’s main parties in supporting Brexit. A significant amount of direct funding is at stake: the EU provides Northern Ireland with nearly a billion euros a year for agriculture, employment, and projects related to the peace process. But the most contentious issue is Northern Ireland’s border with the Republic of Ireland. The border, which was heavily militarized during the conflict, has since become essentially invisible, with people and goods crossing freely. The UK’s only land border, it is set to become an external EU border when the UK withdraws from the bloc. This poses a fundamental challenge to Prime Minister May, who has insisted that the UK will leave the EU’s single market, the arrangement that allows tariff-free trade and the free movement of services, people, and money. May has also pledged to leave the EU’s customs union, whose members apply common tariffs to goods coming from outside the bloc. Instead, she is seeking a trade agreement with the EU that has yet to be defined. The most contentious issue is Northern Ireland’s border with the Republic of Ireland. It is not clear whether leaving the single market and customs union can be reconciled with avoiding a so-called hard border subject to customs and immigration checks. While people might continue to travel freely thanks to a separate UK-Ireland agreement, the Common Travel Area, goods are another matter. One possibility is that Northern Ireland could keep its customs rules aligned with those of the EU, eliminating the need for border checks. This is the idea behind the so-called Irish backstop, a part of the deal May has sought with the EU that would maintain Northern Ireland as part of the EU customs union and single market until a permanent trade deal is worked out. But that has become a sticking point for hard-line Brexiteers in May’s party who reject any measure that would keep any part of the UK tied to EU regulations. Could Brexit threaten the peace process? That is because the agreement established intricate arrangements among the various parties. The Three Strands of the pact created a web of institutions to govern Northern Ireland (Strand One), bring together leaders in Northern Ireland with those in Ireland (Strand Two, or North-South cooperation), and bring together leaders from throughout the UK and Ireland (Strand Three, or East-West cooperation). There are currently more than 140 areas of Northern Ireland–Republic of Ireland cross-border cooperation, ranging from health-care services to energy infrastructure to policing. Many experts and political leaders fear that any disruption to this cooperation could undermine trust in the agreement and thus the basis of peace in Northern Ireland. The reimposition of a hard border between Northern Ireland and Ireland could cause instability in its own right. Some security officials worry that the resumption of customs checks and other border infrastructure would revive lingering tensions between communities and even provide targets for the last remaining paramilitary groups. Prime Minister May and Irish leaders have pledged to protect the arrangements set out in the Good Friday Agreement. However, some Brexit supporters have criticized the deal’s power-sharing institutions and called the pact outdated. Some in the DUP, which opposed the agreement in 1998, have also questioned the arrangements it established. Perhaps the ultimate question is whether Brexit could lead Northern Ireland’s people to vote to leave the UK and join a united Ireland, as the Good Friday Agreement allows. Since the 2016 Brexit vote, nationalist and republican leaders have called for a referendum, which would require London’s approval, though none is imminent. The Congressional Research Service [PDF] examines the Northern Ireland peace process. In Foreign Affairs, Henry Farrell analyzes the repercussions of Brexit on the Good Friday Agreement. A 2018 Economist report takes stock of the situation in Northern Ireland twenty years after the peace deal. The University of Ulster operates an expansive archive of information and primary sources on the Troubles. CFR President Richard N. Haass discusses the 2013 talks in Northern Ireland in a Foreign Affairs video.